Mid sized solo microwaves are nowhere near as common as the 20 litre smaller versions. Here we take a look at a microwave manufactured by Bosch, which based upon their excellent reputation should prove to be reliable. The black HMT84M461B microwave from Bosch features a substantial 25 litre capacity, a comprehensive 900w power output and is finished in a sleek black colour scheme. Looks great, works really well, and as you'd expect from Bosch, it is very well built and should prove to be reliable. The default beep sequence is rather long - this can be adjusted by consulting the manual however. Here we take a look at the mid sized Bosch HMT84M461B, finished in a subtle black colour scheme and providing a comprehensive 900w power output and 25 litre overall volume. 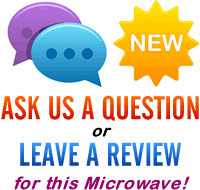 So you're after a decent sized and reliable solo microwave, which isn't garish in style yet is well built and easy to use? The Bosch HMT84M461B fits these criteria, with a crystal clear LED display, and a clear dial and button control system which is both well labelled and very intuitive. Bosch have a reputation for creating incredibly reliable and well built appliances, whether for the house or garden, and the HMT84M461B looks to continue this theme. It's beautifully finished, solid to the touch and will suit any modern kitchen - our testers commented that the HMT84M461B was "desirable" and "reassuringly reliable" . The controls are very easy to operate - all of our testers found it simple to get the HMT84M461B up and running, without consulting the manual - with no complicated menu selections or confusing sequences. The main dial pushes back into the microwave when not in use, to help preserve the minimalist and clean lines of the microwave's black exterior. The interior is very spacious, with a 31.5cm diameter turntable fitted, which is removable for cleaning. The white interior coating wipes clean easily, and we can't see the HMT84M461B needing much maintenance. The exterior isn't excessively large given the capacity, measuring around 30cm by 51cm by 40cm. Five different power levels are included, with the maximum being 900w, which heated up our test dishes at a rapid rate. The only minor issue is that upon it's default factory state, the HMT84M461B features a long beeping audio sequence upon completing it's microwave cycle. However if you check the manual, you can adjust this audio signal so it's replaced by a shorter 3 beep audio alert, which is a lot more practical. This should only have to be performed once - personally we'd prefer the 3 beep sequence to be the default setting as this will be what most people prefer - however this is a minor issue which is easily corrected should you wish. The Bosch HMT84M461B is a superb medium sized microwave, which offers a reliable performance and cooks beautifully. 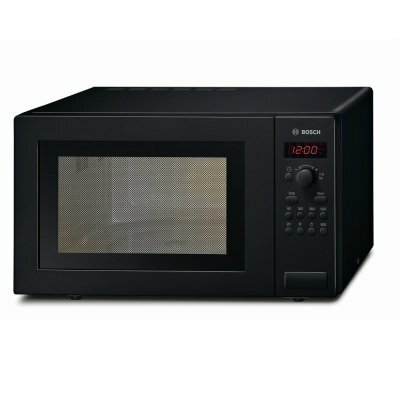 It's pretty powerful at 900w, features a decent capacity, and given Bosch's reputation for manufacturing, we would strongly recommend this model should you be looking to buy a mid sized microwave.